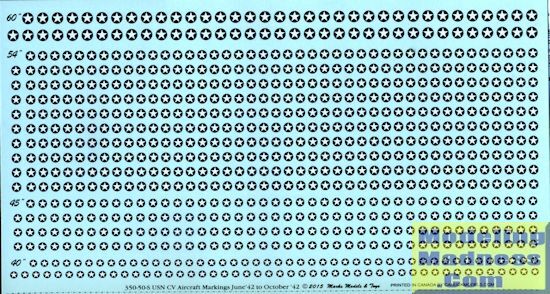 Starfighter Decals has released a new sheet for those modeling carriers in 1/350 scale. 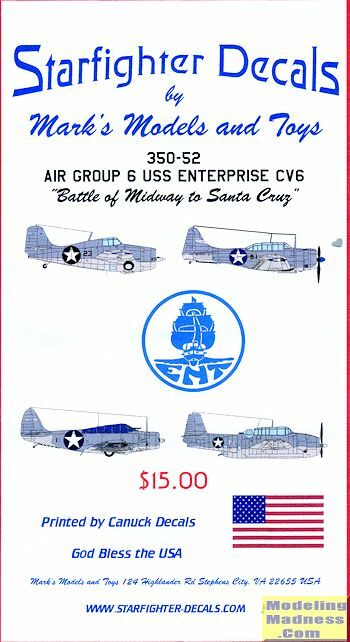 In particular, this sheet covers the USS Enterprise's Air Wing 6 that was aboard during the Battle of Midway and Eastern Solomons in 1942 and Air Wing 10 which was deployed for the Battle of Santa Cruz later that same year. The sheet has insignia in four sizes: 60", 54", 45", and 40". These will fit the planes of the time, including the Wildcat, Devastator, Avenger and Dauntless. There are quite a lot of each size so you should have more than enough to do the air wing. Aircraft of the time period carried little more than insignia and aircraft numbers and those numbers are also included. During this time, the Devastator was replaced by the Avenger and even within the same air wing, there were differences in these markings in the short time between Midway and Eastern Solomons. This set should be most welcome to those wanting to model the Big E during this time of the war.